An authentic recipe for this filled beef roll-up, make it on special occasions and your guests will be impressed, serve with Spätzle (German home-made noodles) or Knödel (German home-made dumplings) and Rotkohl (red cabbage). Tenderize the thin beef slices with a meat mallet on both sides evenly. You can overlap the beef steaks (if not large enough) and seam them together by pounding with the meat mallet. Season with salt and pepper. Spread thin layer of mustard on one side (where the filling will go). Sauté the in small cubes cut bacon with two finely chopped onions until onions are tender, add the chopped parsley. Cut the pickles into thin stripes (lengthwise). Spoon the bacon/onion mixture and add several of the thinly cut pickles on top of the mixture. Roll up the beef tightly (fold sides first over the mixture, then roll up lengthwise, like a burrito) holding in place with toothpicks or wrap with string. Braise Rouladen in some oil (with little butter added for extra flavor) until browned on all sides. Add the finely chopped carrot, onion and celery, season with salt and pepper. Add little beef broth, let simmer covered for 1.5 hours or until beef is tender. More beef broth can be added during the cooking process. 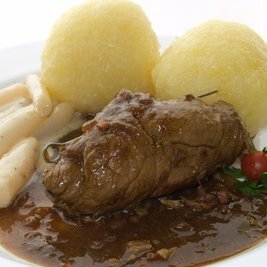 Remove Rouladen from pot, remove toothpicks or string and let rest, strain sauce through a sieve. Optionally you can thicken sauce with some flour: Return strained sauce to pot and simmer, add 1-2 tablespoons of flour to a small cup, add a little bit of cold water to the cup and stir with a fork making a thin paste. Add flour paste to the simmering sauce, stir until sauce is thickened. Season once again to taste. Remove sauce from heat and add the sour cream and 1 tablespoon of tomato paste (optional) and mix to combine everything. Return the Rouladen to the pot. Serve with Spätzle, Knödel, Rotkohl (red cabbage) mashed potatoes, asparagus or green beans. If you can't find thin beef loins at your local grocery store you can ask the butcher to prepare it for you.